What Is Transformation In Math? Transformation involves moving an object from its original position to a new position. The object in the new position is called the image. Each point in the object is mapped to another point in the image. 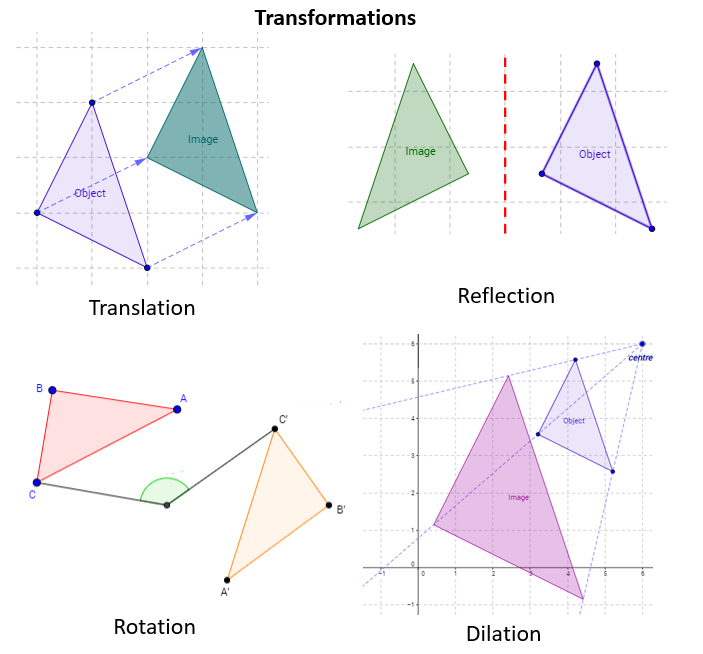 The following figures show the four types of transformations: Translation, Reflection, Rotation, and Dilation. Scroll down the page for more examples and solutions using the transformations. Translation involves “sliding” the object from one position to another. Reflection involves “flipping” the object over a line called the line of reflection. Rotation involves “turning” the object about a point called the center of rotation. Dilation involves a resizing of the object. It could result in an increase in size (enlargement) or a decrease in size (reduction). Translation, reflection and rotations are called isometric transformations because the image is the same size and shape as the original object. The original object and the image are congruent. Dilation is not an isometric transformation because the size of the image is not the same as the object. The original object and the image are similar i.e. they have the same shape but different size. How to translate a polygon on the coordinate plane? How to translate a shape using translation vectors or column vectors? Translations GCSE foundation maths transformations translating shape using translation vectors or column vectors. How to reflect a figure across the y-axis and the x-axis? The following video shows examples of math reflection across the y-axis and x-axis. How to reflect across horizontal and vertical lines? GCSE Maths transformations: Reflections made easy in horizontal and vertical lines. How to rotate about the origin? The following video shows examples of math rotation about the origin (0, 0). The following video shows examples of math dilation with different scale factors.